Even the little skiers get bored with the same runs and are ready for a bit more mountain action. The Blizzard Jr Gunsmoke with 7.0 bindings is the perfect next step for ripping around the slopes. The full camber and composite IQ construction provides excellent contact with the snow and huge edge hold for great freeride control no matter the conditions. Twin tips keep off piste potential crud and crust hang ups and edge catches at bay and reduce the amount of effort needed to initiate turns and carve like a pro. And just in case your little one is paying attention and they are the graphics of the Blizzard Jr Gunsmoke Skis mirror the adult version! Your browser isn't supported for displaying eBay items. 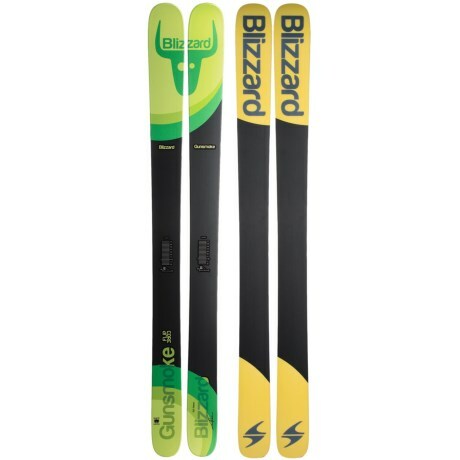 Go to eBay to search for Blizzard Jr Gunsmoke with 70 Bindings Kids.